From the heartland home state of Glen Miller, Cloris Leachman, and Slipknot. Leo LaFlash is the buxom babe with the blue ribbon bazoombas! That's not corn in her pocket, she's just happy to see you! Midwestern maven of striptease, Leo LaFlash, hails from the golden land of Iowa and is known for putting the “Tail in Cocktail” from Minneapolis to Saint Louis. At once fierce and flirty, this cheeky sexpot gives face with finesse offering a performance style that ranges from classic and comedic to modern and back again. Leo LaFlash is founder and producer of Feminine Wiles, est. 2016, featuring a provocative showcase of national and international talent. She is also co-creator and co-Producer of the regional variety show, Misfit Cabaret, est. 2014. When not stripteasing, she can be found working the emcee mic, diving into drag, pole dancing and moonlighting in music videos. In 2015, Leo LaFlash placed second in her division at PSO's Central Pole Championship. Other highlights include fan dancing alongside the musical act Mumfords for the 2013 Mission Creek Music Festival. 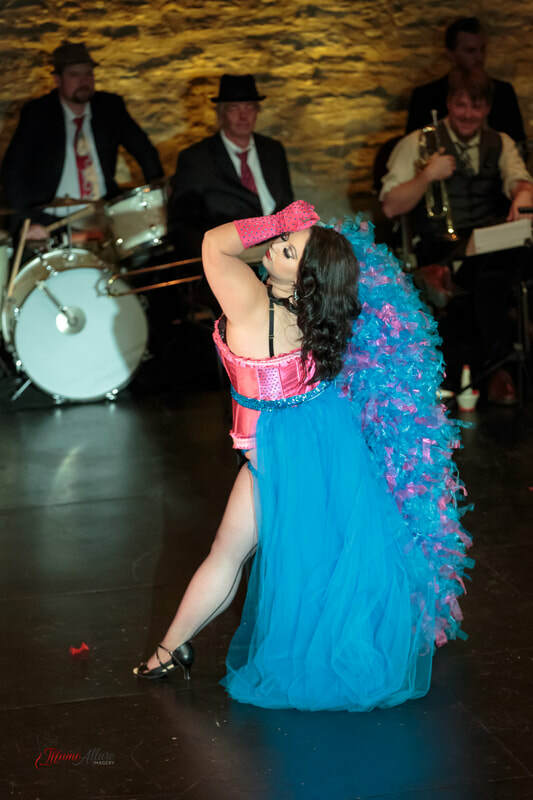 She is a graduate of the Iowa School of Burlesque (2012) and former cast member of the regionally acclaimed show UNDERBUSTED. Stay in the loop with Leo! Subscribe to her mailing list!